Zambeza’s NYC Diesel is a cross between a Diesel, Hawaiian, Shiva and a Northern Lights. Given her formidable genetics, it doesn’t exactly surprise that she came out as a Diesel variety that pleases with many qualities, seen from a grower’s perspective but also when it comes to her superb taste and effect. This is a plant that doesn’t demand a lot from the grower. You can grow her indoors or outdoors with only moderate needs for watering and nutrients. Grown indoors in a tent she can grow to 120-150cm where you can expect harvests of up to 500g/m². In good conditions outdoors, the plant can get up to 190cm tall with yields up to 650g per plant. With a flowering period of 65 days, she won’t break records but will keep things still reasonable, especially considering the outstanding quality of the final product! Diesel lovers will possibly tell you that they like these strains for their eclectic flavours but also for their fantastic highs. Quite as you would expect from a top Diesel like Zambeza's NYC Diesel, she combines a great Sativa high that is energetic and uplifting with the relaxing calm of an Indica, making for a superb smoke for any time of the day. This is the ideal smoke for all kinds of activities where you’d like a boost of creativity and energy but she’s also superb if you want to enjoy her as a relaxing smoke if you simply want to chill at the end of a day. Given that she has 19% of THC, she’s quite potent and you will likely not need more than a couple of hits to feel her great effects. Her aroma is an eclectic mix of refreshing citrus flavours, some sweet and bitter notes with the trademark Diesel finish making for a very interesting and always enjoyable smoke experience that cannabis connoisseurs love. 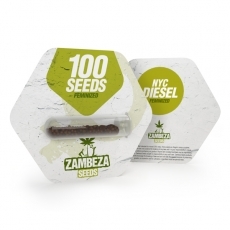 NYC Diesel by Zambeza is a superb Diesel variety where everything harmonises in sheer perfection. This is a Diesel that fully satisfies whether it comes to her yields, great flavour and outstanding high. For all those growers who want larger quantities of this spectacular Diesel, Zambeza offers NYC Diesel bulk seeds in packs of 100 seeds.